Grace O'Gorman was born a healthy, normal child and lives in Bath, England. 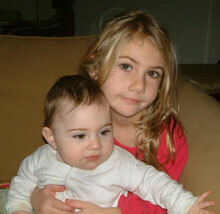 During October 2007 a slight swelling on her right jaw was noticed and assumed to be a normal children's ailment. 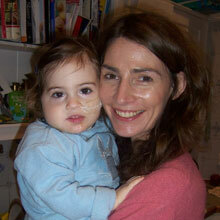 In Mid October 2007 Grace was admitted to the Bristol Children's Hospital for examination. The prognosis showed a relatively low survival rate of approximately 20-25% in the UK. Intensive research indicated her best chance was to go to Memorial Sloan Kettering Hospital (MSKCC) in New York for surgery & Monoclonal Antibody Treatment- with an 80% survival possibility. The Family moved to New York on 7/1/2008 and Grace had her first Surgery on 21/1/08 at MSKCC. Further surgery is now planned. Affected families are wondering why so many children have to go to New York at phenomenal expense and suggest the NHS in the UK and the HSE in Ireland need to address this problem with some degree of urgency.